How many flashcards does it take to change a lightbulb? Some people do it daily (some people wish they did it daily! ), and others only do it infrequently, or even never. For me, spending time on flashcards has become an (almost) daily routine. I have recently already written that you should just do it, about how effective it has been for me, and to tell you how to test whether you should be using flashcards - so take a look if you haven't seen those articles. In this next in the series, I wanted to go personal (yes, even more personal than writing about my love affair - In fact, I'm going to let you look into my actual set of flashcards, through sample sentences, numbers & dates. Anki has a feature which gives you a whole bunch of facts about your specific deck. Here are some of mine, covering the deck itself, as well as how I've used it. according to Anki, 76% of my cards are 'mature' (I've basically seen these often enough that they're 'known', 6% are 'young' (I'm currently actively working through them), and 18% are unseen. In the last week I did 500 cards, averaging about 70 a day. According to Anki, I missed one day in the last week. My average over the last 3 months is 45 cards a day, and over the last year is 52 cards a day. Since the deck was created, I have averaged 53 cards a day, and used Anki just under 5 days a week. The first six entries in my deck are: (know / zhīdào / 知道), (formal / zhèngshì / 正式), (about / guānyú / 关于), (accept,approve / tóngyì / 同意), (after / zhīhòu / 之后), (agree / shuōhǎo / 说好). I think you'll agree that I've improved my skill level over the last two years! And don't let this mislead you ... I don't know all the latest ones. For example, I recently needed to know the word 'loose' while talking to someone and realised I didn't know how to say that. So I looked it up in the dictionary, found a good sentence, and entered it into my deck. A few weeks will pass before this sentence comes up to the top of the pack, and then I will 'learn' it through spaced-repetition. If you'd like to share some of your desk statistics, I'd love to see them - whether you're a beginner or really advanced. Most interestingly, I would love it if you could leave a comment below to say what your first few words were, what your most recent entries are, and what the time period is in between. And if you've just started a deck of your own, perhaps since reading this series on flashcards, let us know what your first few entries have been. Using flashcards for the purpose of studying Chinese might not be for everyone. I gave my best recommendation in this regard in the first article in the series, but if you're looking for a slightly more 'personalised' recommendation, then this article will guide you on what is best for you. With apologies to Jeff Foxworthy and his "You might be a redneck if ..." series of one-liners. When you find yourself (again!) ordering "diet coke" in English in a Chinese restaurant instead of "Jiànyí​ Kelè" ... you should be using flashcards. If you keep getting confused between left & right in Chinese ... you should be using flashcards. If you keep asking your martial arts instructor if you have good sperm, instead of good power ('jing') ... you should be using flashcards. If you can never quite remember the difference between 必须 and 必需 ... you should be using flashcards. If you looked up a word last week but you can't remember the answer ... you should be using flashcards. If you listen to Chinese music, and there is one word you keep hearing in songs but you still don't know what it means ... you should be using flashcards. If there is a Chinese character you see all over town, and you keep forgetting what it means ... you should be using flashcards. If you keep saying 'foreskin' when you mean to say 'briefcase' ... you should be using flashcards. If you find yourself asking your Chinese friend for the 8th time, "How do you say 'influence' again?" ... you should be using flashcards. 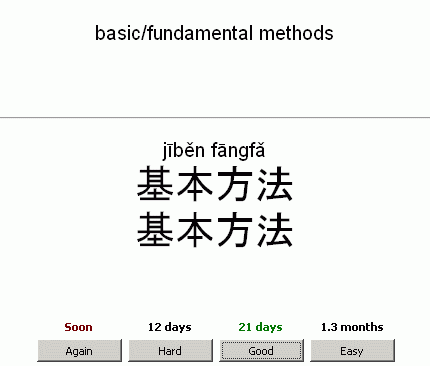 If you don't know which of "我什么都不知道" or "我不知道什么都" is actually correct ... you should be using flashcards. If you can't remember the Chinese equivalent of "When in Rome, do as the Romans do" ... you should be using flashcards. If you sometimes visit Chinese websites, and you're always seeing a button that says "取消" but you don't know what it means ... you should be using flashcards. If you listen to conversations, Mandarin radio or Chinese TV and there are words you still don't know ... you should be using flashcards. 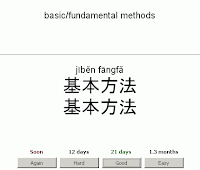 If you are studying Chinese ... you really should be using flashcards. And what about you? What was it in your life that convinced you that you should be using flashcards? In my previous post on the topic, I recommended very strongly that you should be using flashcards as part of your Chinese-learning efforts. In this post I'd like to write a bit about how my relationship with flashcards has gone, and why I find it one of the most useful tools available to progress one's learning. When I started with flashcards, I used a program that was not SRS-based, which was a terrible mistake. A random-card system was fine in school when you were trying to revise the capital cities of the world, but not when you're using it as a tool to learn Chinese words. I would learn a word, and then it wouldn't appear again for weeks, by which time I'd have to learn it again. Or words that I already knew well would keep coming up - wasting my time. So I gave up on flashcards. But it wasn't long after that I found Anki, which felt so natural that I haven't stopped using it since then. Some people load up pre-made decks when they begin - for example there are beginner's Chinese packs available that you can you download directly into Anki. However in my case, there were just a few dozen words that I wanted to learn (or so I thought! ), so I chose to set up my own deck and start with only words that I cared about. 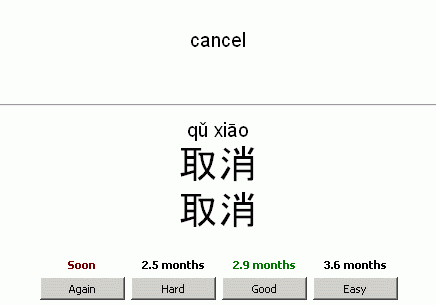 I built three fields for each 'fact': English, pinyin, simplified Chinese. And for each 'fact', I built two 'cards' - one where the English was the question, and pinyin & Chinese were the answer; and one where pinyin was the question and English & Chinese were the answer. To be honest, I didn't even look at the Chinese writing, I was a beginner and I stuck with English & pinyin. Over time, knowing individual words wasn't enough. I needed to use sentences, and frankly my grammar was rubbish. Some of the words I was adding were coming from the About.com daily words email, and ever-practical I realised it would take just as long to copy a word into my deck as to copy a sentence - and thus it began. Again, although my deck is made up of words & sentences that I have added myself, you can choose to take the route of downloading a pre-made deck directly into Anki, one of which is called "20,000 Chinese Sentences". Whatever works for you. I slowly got into Chengyu (I've written about that guilty pleasure before) and have also added a few into my deck over time. To make sure that I was learning words that I would be likely to use in future, whenever I looked up a word in my dictionary, and I felt that I really wanted to remember it, it became automatic to copy that word into my deck too. Took just a few seconds to make another card. Earlier on I was just copying the word (including English, pinyin & Chinese), but over time I made sure that I found a sentence that used the word. This gave the word a context, made it easier to remember than just a lonesome word, improved my grammar, and sometimes included other useful words to learn too. This use of sentences was so valuable to my learning that I wrote an article called Getting Sentenced in Mandarin, about how to track down good sentences. I don't know if building up a deck from scratch sounds like a lot of effort, but if you're only doing a few a day, and since you're just copying & pasting, then it's really quick. Do not let flashcards be your excuse. Do not spend so much time building up a deck that you never get around to using it to learn. Although I learned to recognise a few characters simply by virtue of the fact that my cards included the Chinese writing, this was incidental. It was only a couple of years ago, when I started to formally learn to read Chinese (here is Day 0 of that adventure) that I changed my flashcard practice. Instead of only using English or pinyin as the questions in Anki, I also set it to show me the Chinese version of the words & sentences I had already entered. In Anki, this change took about a minute to make - it's a great program. And of course, having moved to Hong Kong late last year, I am now surrounded by traditional Chinese characters - but my deck was populated with simplified characters! Making some easy edits to my deck format, I added an extra field, and then any sentences that I added after that time would also get the traditional characters added too. I don't test myself based on the traditional characters, but I am still able to compare the two systems when looking at the card. And for now, that's enough. More recently, rather than focusing on words from general conversation, I'm taking the time to build up vocab that I am likely to hear in meetings, or read in documents. Since I'm in the financial sector, these words include things like: assets, credit rating agency, cost of capital, assess, reserves, medical insurance, etc. The process is the same as I've been doing - I find a word I want to learn, look it up, explore sentences of the various results to make sure I've got the right word in the right context, and then copy it into my deck. Usually it takes a few days or a few weeks before that new entry makes it into the queue for me to start learning. There's a lot of debate about whether you should use flashcards for learning Chinese. And perhaps the advice I should give you is: Use it if it works for you, and don't use it if it doesn't work for you. But I should also state that I have benefited so massively from the use of flashcards, that I really believe you should use it - regardless of whether you think it might be useful or not. My use of flashcards has evolved over the years, and that's probably why I'm still getting value out of them, starting with individual words (excluding Chinese characters), progressing through to much more complex sentences which include the hanzi. I use Anki, which is an SRS (spaced repetition system) program that runs on most operating systems. It's incredibly intuitive, very flexible, and free. You may as well install it now, if you haven't already done so, and you can learn more about how to use it optimally in the next few posts I write. One of the more common arguments against using flashcards is that if you are reading books & newspapers & websites in Chinese, then you will end up learning the most common words anyway, without wasting your time on words that you might almost never see. But most students of Chinese are not at that level, and therefore most students really should be focusing on accumulating words as quickly as possible. The more words you know, the more you will understand and the more you will be able to say. A flashcard system is, in my opinion, the best way to get there. So if you're an advanced student, flashcards might not be for you. But for anyone else ... Just do it.